Sprocket Hobs Manufacturers & Exporters in India | Steelmans Hobs Unit. 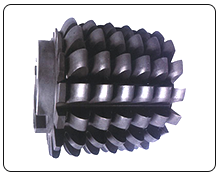 Sprocket Hobs are manufactured for chain sprocket tooth forms as per BS, JIS, DIN, ASA standards with non-topping or full-topping types in single or multi-start designs. Chain Sprocket Hobs are significantly utilized as a part of Roller Chain Sprockets. They are accessible in varieties of none fixing or full fixing in single or multi begin. We configuration, produce a variety of Chain Sprocket Hobs according to the guidelines i.e., ANSI B 92, JIS, DIN 5480, 5482, HES and so on as per the client particulars. The apparatus cutting devices have a long life, exceptionally strong and precise. Steelmans Chain Sprocket hobs are made according to DIN standard. Chain Sprocket Hobs are covered according to client prerequisite. We have earned a name of trust and quality worldwide in assembling and fare of Chain Sprocket Hob makers in India. A few assembling and exchange assets show us as their most trusted producer exporter in the rundown of Chain Sprocket hobs and apparatus cutting devices. Each Chain Sprocket hob has a smooth complete, exact outline and high quality. Crude material utilized is M-2 (6.5.2). Your device is produced 100% according to the drawings at each stage. Time due date : We comprehend the bottom-line of your business. Correct due date is met for each request, little or huge. In the wake of putting in the request, no telephone call or postponement is reasonable at our end.